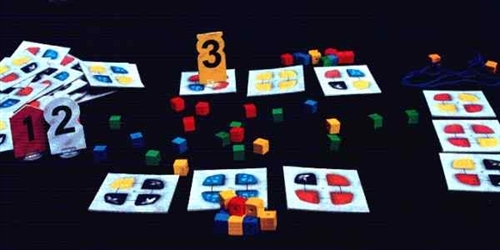 This game was originally published as Tetragons in 1997 in a small trial edition, and then as Oraklos in 2002. We have only very few copies available. You may be able to find them somewhere else at better prices. 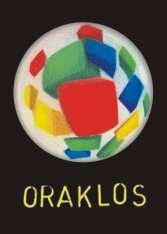 In Oraklos, players predict the future by throwing many-coloured dice onto the table. By gazing at the resulting pattern, they simultaneously try to find elements of the prediction Alexander wants to hear. The fastest sweettalking soothsayer wins the game. Apart from the standard game, Oraklos contains 2 variants. Oraklos Junior, an easy variant, is suited for children from 6 years onwards and children will often beat the adults! Antipodes is a more difficult game, suitable for players from 10 years onwards. All variants take about 15 minutes. The playing material consists of 70 wishcards, 54 dice, 3 audience tokens, a measuring cord and rules in English, Dutch and German.